The Society is managed by a professional office staff, but the vision and goals of the organization are directed by its Board of Directors, various committees and task forces. For more information on each committee, see below. To see the current members and contact info for each committee, please visit the Leadership page. The SPSP Awards Committee appoints, oversees and works closely with the Award Nomination Panels, who nominate and select SPSP award recipients using various processes, criteria, and the spirit of the award. The Awards Committee also works to continuously improve and expand SPSP's awards program. Finally, the Awards Committee selects the annual "Service to the Field" award. The Communications Advisory Board serves as advisors to SPSP staff on science involved in our communication and media relations efforts. General tasks include identifying subject matter experts in particular areas for specific media or policy requests, providing input on newsworthiness of new research, and alerting staff of opportunities to connect research to current news. Members of the CAB serve two-year roles and will be asked for input 2-3 times per month. The Convention Committee organizes numerous aspects of SPSP's annual convention and preconferences. In addition to oversight of the whole convention, specific responsibilities include selecting convention locations, awarding convention travel funds, overseeing the Legacy program, etc. Three-year committee members: These individuals make up the core of the committee and serve for thee years. Each year, a different task is assigned to individual. First year is oversight of the awards addresses, second year is oversight of the Legacy program, and third year is chair of the convention. Two-year committee members: These individuals serve on the committee for two years. The first year is oversight of the Early Career Mentoring Happy Hour and the second year is Out of the Lab. Science Program Reviews: Two members are assigned to this task for two years each. The first year, the pair is responsible for programming all single presenter sessions (posters, data blitzes, and single paper sessions). The second year, the pair manages symposia selection and the two invited sessions. The Diversity and Climate Committee monitors diversity in the organization and funds efforts to support the conference attendance of students who come from underrepresented groups (e.g.,ethnic or racial minority students; first-generation college students; lesbian, gay, or bisexual students; transgender students; and/or students with a physical disability), in an effort to increase the diversity of personality and social psychology. The Fellows Committee works to identify SPSP members with longstanding contribution to SPSP and the field of Personality and Social Psychology. Those selected by the Fellows committee then become SPSP fellows themselves. The SPSP Fundraising and Development Committee works to raise funds to support SPSP’s core areas of activity. Specific projects include the Heritage Wall of Fame, annual giving campaign, and working with individual donors who are interested in supporting SPSP and the field of social/personality psychology. The Government Relations Committee provides advice and support to the SPSP staff and Board of Directors on advocacy for social and personality psychology. 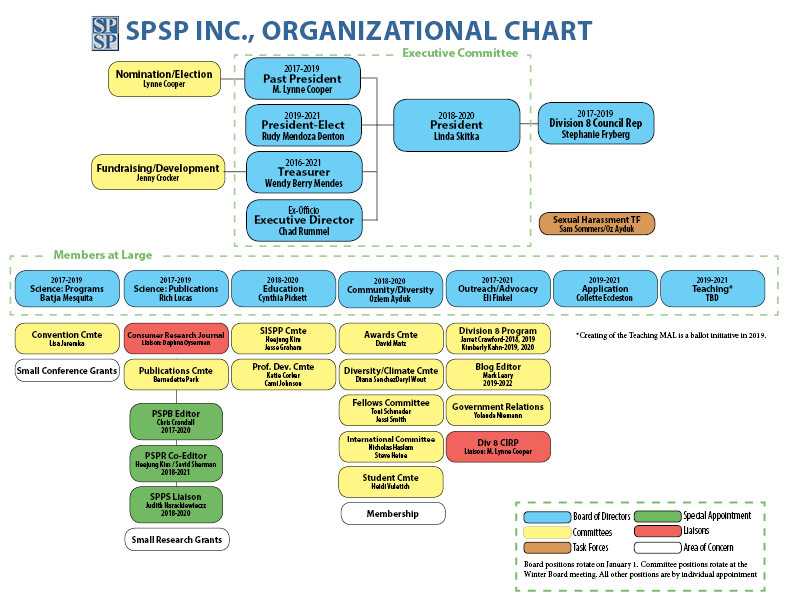 The Committee contributes to the specification of strategies, priorities, and mechanisms that can best permit SPSP to promote the field by engaging members to support the goals of the committee. The primary focus of the Committee’s attention is on national policy and the federal system of research and development (R&D), whether in the legislative, executive, or judicial branches of government. The SPSP International Committee seeks to make SPSP and the field of social and personality psychology more geographically diverse, both in terms of researchers and the populations they study. The committee works to continuously improve the ways that SPSP’s conferences, publications, programs, and website can become more internationally diverse. Nominations Committee will solicit nominations for open positions (Boards and Committees), review nominations, and make recommendations to the SPSP Board of Directors that reflect the goals and values of the organization. Providing training opportunities on cutting edge theories and research. Providing instruction about innovative research methods and data analytic tools. Providing training relevant to a diverse array of career choices and trajectories both within and outside of academia. Facilitating networking among those who work on related topics from different theoretical and methodological perspectives, and among personality and social psychologists working within and beyond the walls of the academy. The Publications Committee works to maintain and improve SPSP journals and discuss new initiatives of knowledge dissemination. Some tasks include finding editors, selecting Student Publication Awards Winners, assisting with challenges around publications and specific inquiries, etc. The Student Committee works to promote the interest of SPSP's student members. This includes producing helpful student content, organizing events for student members at the annual convention, and much more. SPSP offers bi-annually (in odd-numbered years) a two-week, intensive summer experience for up to 100 pre-doctoral students in social and personality psychology. The SISPP committee works to select SISPP locations, candidates, faculty, and curates courses and workshops. For information on getting involved in SPSP governance, please visit Get Involved.